Take a look back at the gifts of discovery and renewal from RLG as well as some exciting sightings at year's end! Looking back through the 2015 Chirps & Hums, I’m amazed at the year’s worth of great discoveries and sightings that Reserva Las Gralarias gifted us with and the many research and plant regeneration projects that gave back to the reserve. What a special place RLG is! Spring found the Las Gralarias Foundation & Reserva Las Gralarias (RLG) making headlines as local and international newspapers, websites, radio, TV and magazines announced the discovery of the Mutable Rainfrog (Pristimantis mutabilis) at the reserve. The summer saw the Chocó endemic Club-winged Manakins returning to form their large summertime leks, as they do each summer at RLG. A Blunt Hedgehog-Lizard, (Echinosaura brachycephala), endemic to the Pacific slopes of Ecuador, also showed at one of RLG’s patios. Only a few dozen of this species have ever been seen; only two individuals are known from the Mindo area and those two are from the patios at RLG. In August, Jane watched a rare Olinguito feed in a tree above the guest house. This was the first confirmed sighting at RLG of the newest carnivorous mammal described in the Americas. In September, a tiny dwarf gecko called a Spiky Lirecko (Lepidoblepharis conolepis) was found wiggling along the outer guest house wall. 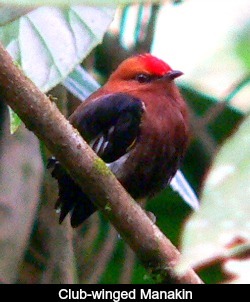 Considered uncommon, in the Mindo area, it has been found only at RLG. As fall continued, RLG enjoyed the first banana feeder record of a Black-capped Tanager (female), Lemon-rumped Tanager (very common at lower elevations) and a Rufous-chested Tanager as well as the first record of Wedge-billed Hummingbird (female) at the reserve’s feeders, bringing the RLG Hummingbird feeder list up to 24! October brought the first record of Rusty-margined Flycatcher, usually a lower elevation species, at RLG. Adding to the rarities, both Scaled Fruiteater and the very rare Hoary Puffleg were seen at the guest house, and the increasingly rare Wattled Guan was heard along two of our trails. Clearly, Reserva Las Gralarias is teeming with the life of a healthy cloud forest. The numerous hardwoods we’ve planted, even a tree species once classified as extinct, are thriving. We’ve identified many of the beautiful orchids and other native wildflowers and plants that live in the reserve. Today we know that Las Gralarias is home to 11 rare species of frogs and many other amphibians, over 35 species of mammals, hundreds of species of moths and butterflies, and many more insects. All of this is in addition to the growing populations of many cloud forest birds who have responded to the reforestation of their native habitat. As you plan your year-end giving, I hope you'll join in the effort to purchase the necessary land to complete an essential conservation corridor of some 3 square kilometers, or almost 2 square miles. When you help protect and restore the entire upper watershed of the Santa Rosa River, you help increase habitat for an amazing biodiversity of plants and animals and support discoveries that teach us more about the complex web of life in Ecuadorian cloud forests. Not many non-profits can make the claim that 100% of all membership and donation dollars support their mission, but LGF can. The foundation’s board and support team members all volunteer their time to LGF as well as cover any costs the foundation incurs. Make a gift today! Link to PayPal or JustGive to make your donation or send your contribution to Las Gralarias Foundation Inc., 24140 Gessner RD, North Olmsted, OH 44070. LGF is a non-profit 501(c) (3) organization, so all donations are tax-deductible in the United States. Missed the Fall/Winter issue of The Hum? Link to it here and settle in for a bit of reading pleasure. Another new frog species has been described from RLG! The new rain frog, known as Pristimantis pahuma, was described in the paper Hutter and Guayasamin, 2015, Neotropical Biodiversity, 1: 42. The main field work was done at RLG and the holotype was collected at RLG on our upper Santa Rosa property at 2235 meters elevation. As with two other new frog species described from Las Gralarias, this new rain frog was discovered initially by noticing differing songs among one species, in this case of Pristimantis calcarulatus. This led to collection of bioacoustic data and eventually molecular data which confirmed that what had been thought was and what appears morphologically to be one species is, in fact, two species. This discovery underlines the importance of in-depth research of the species in the field: song, behavior, and, as in the case of the recently described P. mutabilis, potential physical changes. It also points to the ever-changing taxonomy of Andean frog species! 1 November 2015, 8.am -- Our “resident pair” of migratory Blackburnian Warblers were finally again seen feeding in the tall Croton sp. trees near the kitchen. Of course we do not know if it is the same pair that returns every fall, or even if they are really a pair, but it is always exciting to see any of these beautiful northern migrants once again at RLG. 16 November 2015, 1.30pm -- Two Crested Guans were seen feeding along lower Brothers Trail. This sighting along with recent records of Wattled Guans and our regularly occurring Sickle-winged Guans is exciting as together they indicate that all of these large birds, historically hunted, are at least stable on the reserve. Let’s hope the two Crested Guans were in fact a pair. 17 November 2015, 7am -- I first heard an unknown (to me) owl calling on 11 July. I told our caretaker Segundo Imba to try to get a recording of it when he was staying at night at the reserve. He finally managed to get a very good recording of it and birding guide Marcelo Quipo identified it as Rufous-banded Owl, a new species for RLG and our seventh owl species! Although regularly seen and heard on the east slope of Ecuador, this owl is considered rare to uncommon on the northwest slope. 22 November 2015, 9.40am -- A chick of the Common Potoo was found by birders along Guan Gulch Trail. The downy chick with just the beginning of a tail was trying to look like the top of a dead stump. 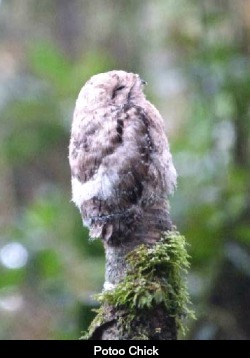 Potoos are nocturnal and known for spending their days perched upright on tall trees or even on fence posts and appearing to be part of the wood itself. The female lays one egg on the top of a stump and the egg hatches there. This chick is now large enough that the mother no longer fits on the stump but she no doubt is keeping a close (and not quite closed) eye nearby. 25 November, 11.40am -- An amazing larva was found by our cleaning staff on the walkway near the lab. 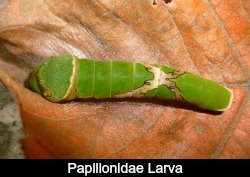 The larva was attached by a bit of its own silk to a Croton sp. leaf that had fallen from an overhead tree. It had a prominent “X” pattern on its dorsum and thorny projections on its "face." When disturbed, the larva reared up, expelled a strange odor, and ejected a bifurcated purple tongue-like structure. Thanks go to Dr. Gunnar Brehm of the Phyletisches Museum in Jena, Germany, who identified the creature as a larva of the family Papilionidae, the swallowtail butterflies. 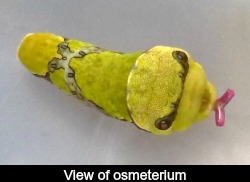 The tongue-like structure is called an osmeterium, which is a defensive organ unique to the family Papilionidae. We have only recorded two species of swallowtails at RLG, Pterourus cacicus and Eurytides servile, and it is nice to know these beautiful butterflies are reproducing here. The only question is: what is this larva mimicking with a big ‘X’ on its back? In the Amazon, larvae are known to mimic small arboreal and highly venomous fer-de-lance snakes. Hence, this larva’s potential mimicry of an X-decorated Bothrops sp. (fer-de-lance) snake is a bit disconcerting. Are there possibly small arboreal Bothrops in the cloud forest? 26-27 November 2015, mid-morning -- I had known for years that at least one Barn Owl had been at RLG because I found the feather of one, and having worked extensively with Barn Owls in the US, I recognized the feather. But no one had ever seen or heard the species at RLG--until now! Finally, we have confirmed a Barn Owl on its day roost along Crossover Trail. A visiting birder snapped several good photos and commented on how large the bird was compared to the same species in Europe. The Barn Owl in Ecuador is Tyto alba contempta, a race confined to western Colombia, Venezuela, mostly western Ecuador, and Peru. 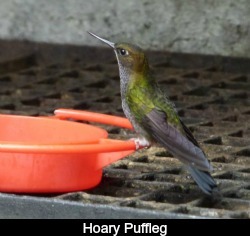 6 December 2015, 10.28am -- The rarest hummer in our area is the Hoary Puffleg, a fairly nondescript and timid hummer that we have been fortunate to have visit our feeders on an irregular basis for many years. For some reason, the resident hummers just do not tolerate a Hoary Puffleg, and they all attack it as soon as it arrives. Though not prone to fighting, the puffleg does defend itself a bit by showing its white leg puffs but usually it just flees. This season it appears to be a bit more aggressive or at least stays hidden near the feeders trying to avoid the bullies. It now even feeds at the feeders in what was previously our barbecue pit. More in-depth news of exciting sightings at RLG is in the Fall/Winter issue of The Hum. For birders, December = Christmas Bird Counts. The National Audubon Society’s Christmas Bird Count is the longest running citizen science project of all time with 116 years’ worth of recordings. Participation spans the western hemisphere and provides researchers and conservationists with data used to monitor population trends, distribution shifts, and is invaluable for directing conservation efforts. Anyone can get involved and can participate from home, while visiting family and friends over the holidays, and even at Reserva Las Gralarias! In fact, in 2013, a whopping 102 species were recorded for the Christmas Bird Count from just the lower portion of Reserva Las Gralarias! To join a count, visit The National Audubon website, locate on the map a region (circle) in which to participate, and contact the coordinator to volunteer. The day often culminates with a celebratory gathering full of food, merriment, and stories of the day’s observations. You can be a part of history and a citizen scientist by joining a Christmas Bird Count! Please share this issue of The Chirp with your friends and share your CBC stories with us on Facebook. It would be wonderful to know how many of our LGF supporters take part in a count. So go work off those holiday cookie calories: get outside and bird!